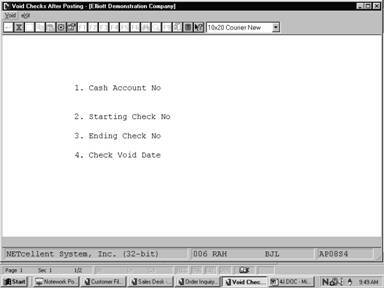 Void Checks After Posting allows you to void checks that have been posted to Accounts Payable incorrectly. 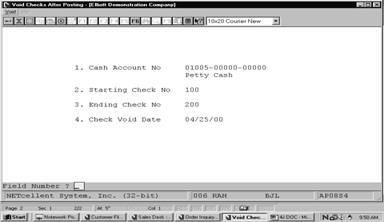 Checks can be voided from only one cash account per run. If you use multiple cash accounts then this application may need to be run more than once depending upon what cash account the incorrect checks effect. A standard account number in the standard account number format. Enter the account number of the cash account from which the voided check is to be applied. Enter the beginning of the range of check numbers you wish to void. The starting check number must be a valid check in the A/P Open Item File. Enter the end of the range of check numbers you wish to void. Enter the date the check was voided.